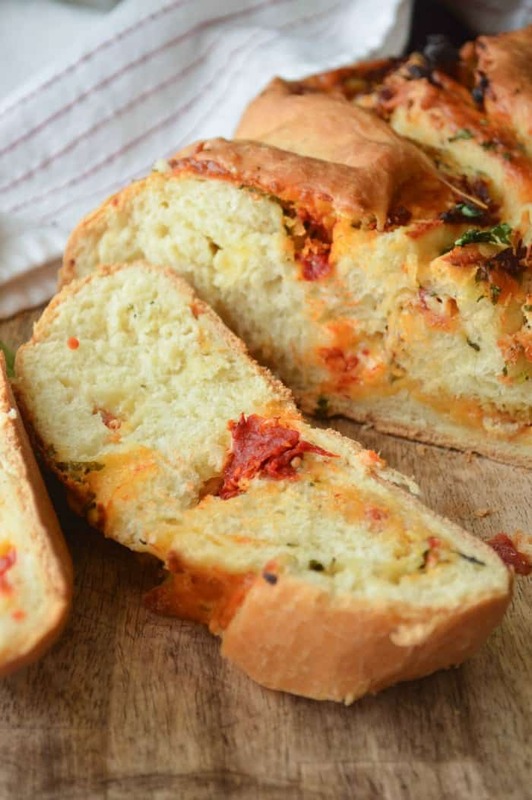 This Easy Cheesy Italian Bread is loaded with your favorite cheesy blend, garlic, basil, and roasted tomatoes. 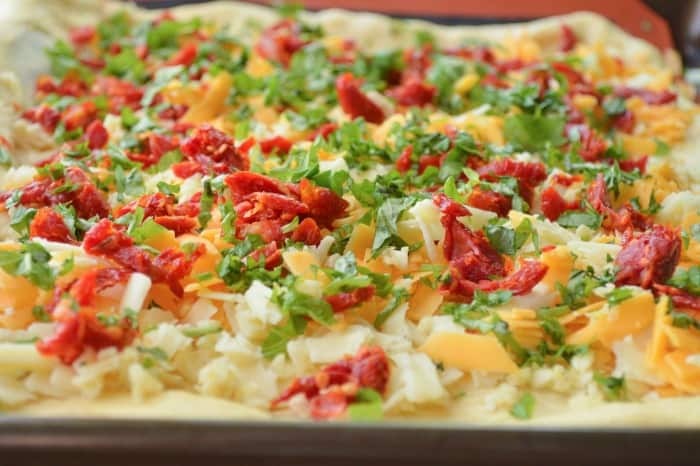 It comes together quickly and is sure to complement your next meal. This post is sponsored by Silpat® – the makers of the original non-stick baking mat!. All opinions and photos are my own. Working with brands I love lets me share great products with you while helping to keep the lights on. Is there really anything better than a hot buttery slice of freshly baked yeast bread? Bread BAKING is at the top of my list in terms of things I just really love to do in the kitchen. Yeasted Croque Monsieur Rolls and from-scratch Apple Biscuits with Honey Butter Glaze. Homemade Brioche Buns and this Classic Crusty Herbed Dinner Loaf. I get as much joy out of the bread-baking process as I do from eating the finished results. There are a few things in the kitchen that can make bread-baking simple, or can at least help simplify some of the logistics. 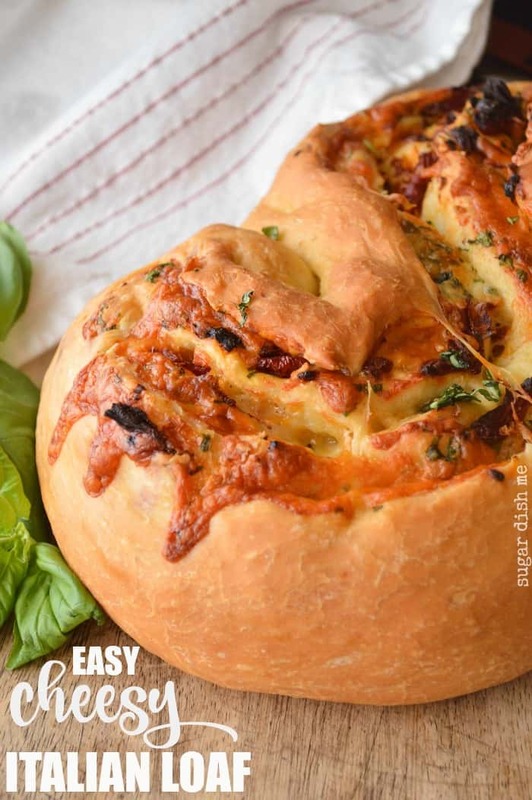 A stand mixer can be pretty handy (and will definitely help you whip up this Easy Cheesy Italian Bread super fast), but there’s a lot to be said for the actual kneading process, so expensive stand mixers are not a requirement. A good, sturdy bowl, a trusted silicone spatula, and a canister that lets you reach in and grab flour with ease are all tools that make your bread life easier. There’s one thing I’m not sure how I ever managed all my bread-baking without, though. 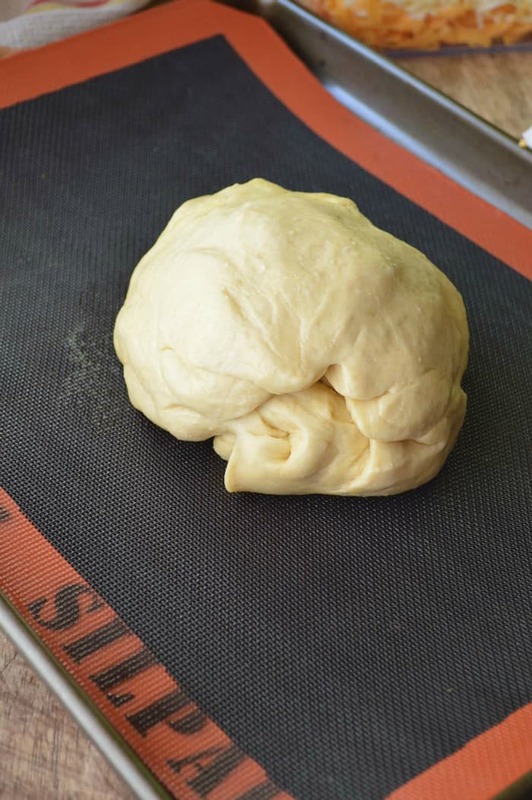 Silpain – the bread-baking mat from Silpat®(the ORIGINAL non-stick baking mat). 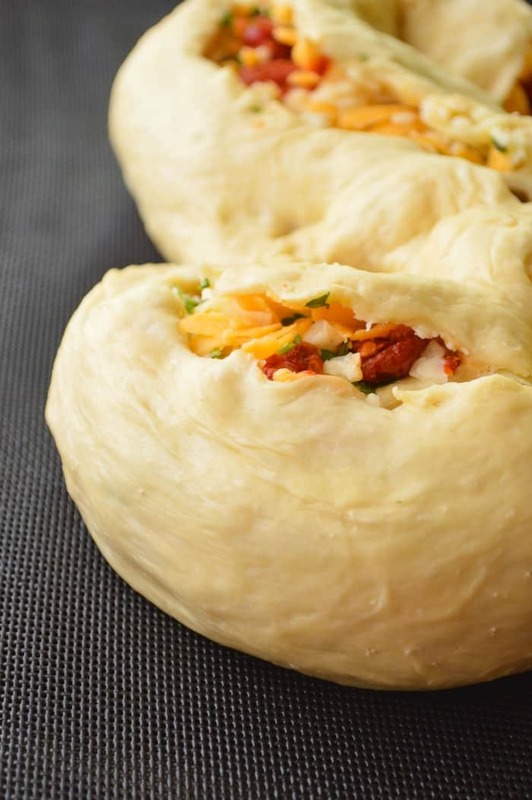 Silpain non-stick properties are effective in freezing, proofing and baking for all dough types. So it doesn’t matter if you are making Easy Cheesy Italian Bread Stuffed Spinach Bread or Giant Cinnamon Rolls. This silicone-coated fiberglass mat has got you covered. The fiberglass works its own magic because it gives you maximum heat transfer during baking. The perforated mesh helps to give that perfect crusty finish. Basically Silpain does all the good and important bread things. 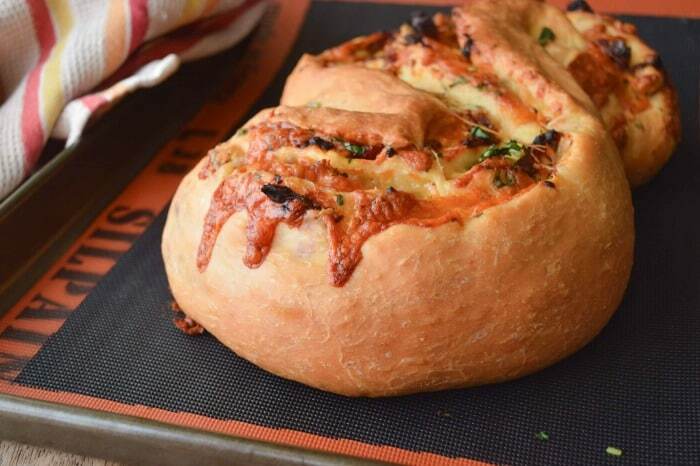 I used my Silpain for this Easy Cheesy Italian Loaf just to show you how perfectly pretty the results can be. 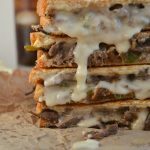 Just the right bite and texture and ALL THE CHEESE. 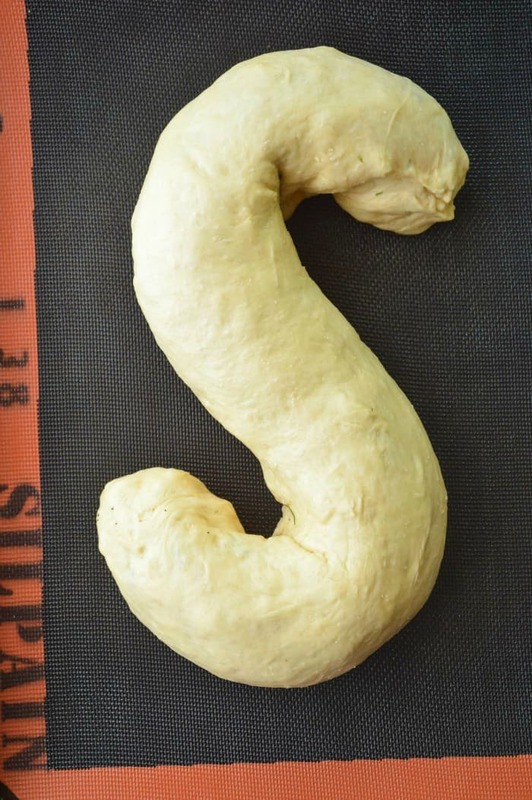 Bonus: the cheese also DOES NOT stick to the Silpain. 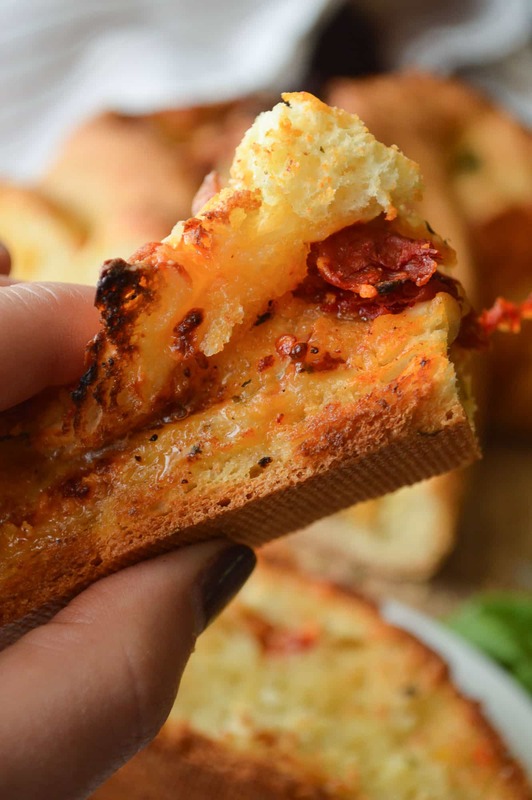 So you can overload your Easy Cheesy Italian Bread to your heart’s content. This recipe is the best kind — dump, mix, and go. You can really go with any kind of cheese that your heart desires, but I went cheddar blend in 2 of my 3 recipe tests and it was a win. The fresh basil, minced garlic, and sun dried tomatoes are all additions that load this bread with flavor (and color!). The perfect crust that the Silpain yields will NOT disappoint. 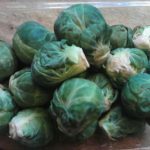 —Hilarious Story Interlude— I made this recipe to share with you (and Silpat®!) and then had to travel for work. I had grand plans of working on the plane and then I left my camera card on some random table in the airport. In the throes of panic I messaged Nicole at Or Whatever You Do from the plane on my 5 1/2 hour flight, to tell her that I am a complete idiot. I mean really. WHO DOES THAT?! Anyway, Nicole is awesome and she actually made this recipe and sent me a whole other set of gorgeous photos to help save me from my scatter brain. Silpat® granted me an extension because they are amazing (clearly) and so I had time to reshoot all the photos you see here. 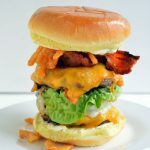 All of this is to say though, that this recipe has been tested by not one but TWO food bloggers and it comes together super quick. And if you are looking for more delicious things to make with your new Silpain baking mat, you should absolutely try Nicole’s recipe for Roasted Garlic Twisty Bread. Homemade Bread Cups for Soup !! 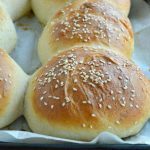 This is one of my favorite homemade bread recipes EVER. Move over, Panera. 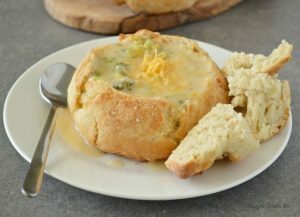 These little bread bowls only take an hour! 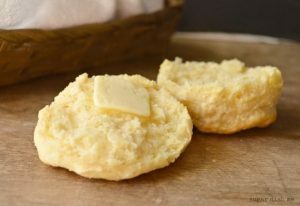 Greek Yogurt Cheddar Biscuits are fluffy and perfect, especially if you are looking for biscuits on the lighter side of things.